Have you ever noticed the copious amounts of food laid out at in-house business meals, client meetings, staff trainings and the like? There's always too much. There has to be. The person doing the ordering often doesn't know in advance who likes what, who's vegetarian, or who can't have salt. The person doing the ordering often doesn't know how many people are coming and even if a head count exists, it can change without warning. Firms can't run the risk of running out of food in front of their clients. So, the person ordering the food orders a lot. That usually means one thing. Leftovers, sweet leftovers. Music to Food Runners ears. "We'll need a Food Runners pick up every day next week," Liz from Zynga Games Network explained into the phone a few Thursdays ago. "We're going to be busy." That same call has come in every week for the last three weeks. Food Runners volunteers can't stop gushing about the quality and quantity of the Zynga donations nor about how ecstatic recipients like the ladies at the Oshun Center are. Zynga discovered Food Runners just over a year ago and has been donating multiple times per week ever since. "Our in-house trainings always generate too much food," Richard at Genentech agonized to Food Runners. "I can't stand seeing it thrown away. It just isn't right," he continued. "Can Food Runners help? Trainings are usually held a couple of times a month. How can we do this?" Food Runners leaped into action. Since July, Richard's calls come in at least a half dozen times per month. Food Runners is always there. Carlene from Calvary Asset Management rang up as she does with some regularity. "We had a client lunch today with significantly lesser attendance than we anticipated. I have four trays of sandwiches to donate. I 'll bring them down when the Food Runners volunteer arrives." The at-risk teens at the Vietnamese Youth Development Center after school program concentrated better on their homework that afternoon. Food for thought, literally, thanks to Food Runners. "We over-ordered so huge for our meeting today," sighed Joe of Eveo last Friday. "I have two very large boxes full of fresh burritos, chips, beans, salsa and all the fixin's." Within minutes, eager Food Runners volunteer Lindsay C. was dispatched. 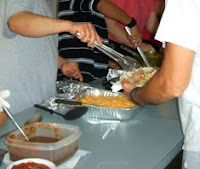 Clients at Ozanam Reception Center enjoyed a full on Mexican feast that evening. All over town, more and more firms like those mentioned above as well as Digg Inc., Sephora University, Sidley Austin, Beast Editorial and TPG Capital are calling Food Runners more and more often too come pick up their in-house excess. It's a great system. Everyone wins. And it's so easy. And it's free. Neighbors helping neighbors. Just the way it should be. 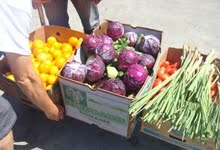 Food Runners picked up and delivered 113,590 pounds of in the month of March. Volunteers performed runs 887 and the truck did 231. Please welcome very special new donor Flour and Water. Two weeks ago, Flour and Water chose to join Food Runners planned overage program meaning that once a week, they make food specifically for donation to Food Runners who, in turn, delivers it to a shelter. It's baseball season. What does that mean to Food Runners? More food! Food Runners picks up excess ballpark food from Bon Appetite Management Company after every home game. More food. More full bellies. Please pass the mustard.